Nanocomposite fibers have attracted intensive attentions owing to their promising applications in various fields. However, the fabrication of nanocomposite fibers with super toughness and strong strength under mild conditions remains a great challenge. Here we present a facile flow-induced assembly strategy for the development of super-tough and strong nanocomposite fibers with highly ordered carbon nanotubes (CNTs), which can be induced by directional and fast flow on a grooved hydrogel surface. The prepared nanocomposite fibers show excellent mechanical properties, with a tensile strength up to 643±27 MPa and toughness as high as 77.3±3.4 MJ m−3 at ultimate strain of 14.8±1.5%. This versatile and efficient flow-induced alignment strategy represents a promising direction for the development of high-performance nanocomposites for practical applications. Chuangqi Zhao is currently a PhD student at Beihang University. He received his BSc degree in materials science from Changchun University of Technology (China) in 2012, MSc degree in applied chemistry from Beihang University (China) in 2015. Then, he joined Prof. Lei Jiang’s group at Beihang University. His current research interests focus on the superwettability and applications of bioinspired gel materials and development of novel bio-inspired multi-functional, high performance layered nanocomposite materials. Pengchao Zhang received his BSc degree in materials science (2010) from Wuhan University of Technology (WHUT), China. Then, he joined Prof. Lei Jiang’s group and received PhD degree from the Institute of Chemistry, Chinese Academy of Sciences (ICCAS) (2016). He currently holds a postdoctoral position in Houston Methodist Research Institute/ Weill Cornell Medical College. His current research interests focus on the superwettability and applications of bioinspired gel materials and development of novel microfluidics for single cell analysis. Tianyi Zhao is an associate professor at Beihang University. She received her BSc degree from Jilin University in 2004. Then, she joined Prof. Lei Jiang’s group and received PhD degree from ICCAS in 2010. She then worked as an assistant professor in Beihang University. Her current research interests focus on bioinspired materials with super-wettability and their applications in catalytic fields. Mingjie Liu is currently a full-time professor at Beihang University. In 2005, he joined Prof. Lei Jiang’s group and received his PhD degree from the National Center for Nanoscience and Technology, Chinese Academy of Sciences (2010). He then worked as a postdoc in Prof. Takuzo Aida’s group in Riken in Japan from 2010 to 2015. In 2015, he was awarded the “1000 Youth Plan program” and joined Beihang University. In 2017, he was awarded the National Science Fund for Distinguished Young Scholars. His current research interests focus on anisotropic soft matter with ordered structures, bioinspired design, and application of gel materials. 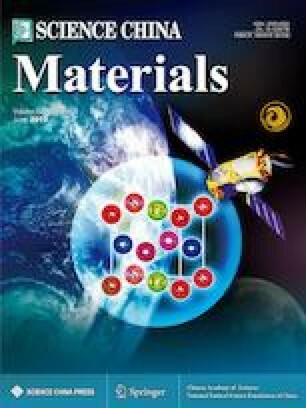 Supplementary material is available for this article at https://doi.org/10.1007/s40843-019-9421-y and is accessible for authorized users. 纳米复合纤维由于其广泛的应用前景受到科学家的关注. 但 是在温和条件下制备具有优异断裂韧性与高强度的纳米复合纤维 仍然面临很大的挑战. 本文中, 我们展示了一种简单的基于液流组 装的策略用于制备具有超高断裂韧性与强度的纳米复合纤维. 在 准液态的水凝胶表面和重力的双重作用下, 含有碳纳米管的水溶 液可以沿水凝胶沟槽极快速地流动, 从而诱导碳纳米管取向排列. 我们制备出的纳米复合纤维拉伸强度和断裂韧性分别高达643± 27 MPa和77.3±3.4 MJ m−3, 极限断裂伸长率14.8±1.5%. 这种具有较 强普适性和高效率的液流诱导取向策略为高性能纳米复合纤维的 实际应用提供了新的可行的发展方向. This research was supported by the National Key R&D Program of China (2017YFA0207800), the National Natural Science Foundation of China (21574004), the National Natural Science Funds for Distinguished Young Scholar (21725401), the 111 project (B14009), the Fundamental Research Funds for the Central Universities, the National “Young Thousand Talents Program”, and the China Postdoctoral Science Foundation (2017M620012).